I’ll never forget the day that forever changed my life. I was sitting on an ice pack in my hospital gown postpartum, exhausted, yet gleefully chatting with my husband about how amazing it was to be parents, as we enjoyed our first baby. Our son’s pediatrician walked in trailed by a serious looking physician and an entourage of interns. Our pediatrician had felt a “funny lump” during our son’s newborn check and had ordered a precautionary ultrasound. My husband and I looked at each other and wondered what was happening. The next thing I know I’m hearing the words “ultrasound...baseball sized tumor...cancer...surgery...chemo.” It was a blur. I just mentally froze up. We were talking about our first born. He was less than 2 days old, how could this be?!?! The news landed like a sucker punch to my gut, the air stopped moving through my lungs. I was stunned, uneducated about cancer, fearful for our son, and shocked that this could even be possible. The doctors explained that immediate surgery was required to excise the tumor otherwise our son would not live. It was an excruciating painful reality and we had to make the decision right then and there. We were rapidly transferred from labor & delivery into children’s oncology. Our son was the youngest patient they had ever admitted, in fact he was the youngest person in the country at the time to be diagnosed with neuroblastoma. Oncology graciously made arrangements for me to stay in the room with our baby since I was nursing and feeling fiercely protective - no way was I leaving him alone in the hospital. We had two exhausted, bewildered and confused days together before surgery. So many tests, so many people asking questions. On the fourth day of his life, I held our son and wept. The oncologist, normally a professionally dispassionate doctor, was delighted with the surgical result and gladly informed us that it was unlikely our son would require chemotherapy, they had cleanly taken the full tumor along with a few lymph nodes to test - just to be safe. It was crushing for everyone when that same doctor had to come back the next day and dejectedly tell us the lymph nodes had tested positive for cancer and chemotherapy would be required. Our 4 day old son endured five months of chemotherapy. It was a long, drawn out process with endless trips to the hospital, frustratingly doing my best to breastfeed a baby on chemotherapy. Through it all we were offered, and welcomed, generous support from family, friends, medical staff, and total strangers. Hundreds of people all over the world prayed for our son. Our parents were amazing. Both our Moms rocked our screaming son for hours just so my husband and I could get a quiet meal together. I remember once when I was giving our son his dose of chemo, my Dad stood beside me and asked if there was anything he could do to make it easier. I shook my head in defeat explaining how wrong it felt to poison my baby in order to save him. My strong, stoic Dad, rarely speechless, started to cry. So how does this inform my work as an End-Of-Life planning Advisor? Well first let me say, our son is a thriving survivor who has grown into a engaging, delightful adult with a unparalleled ambition and energy for life! 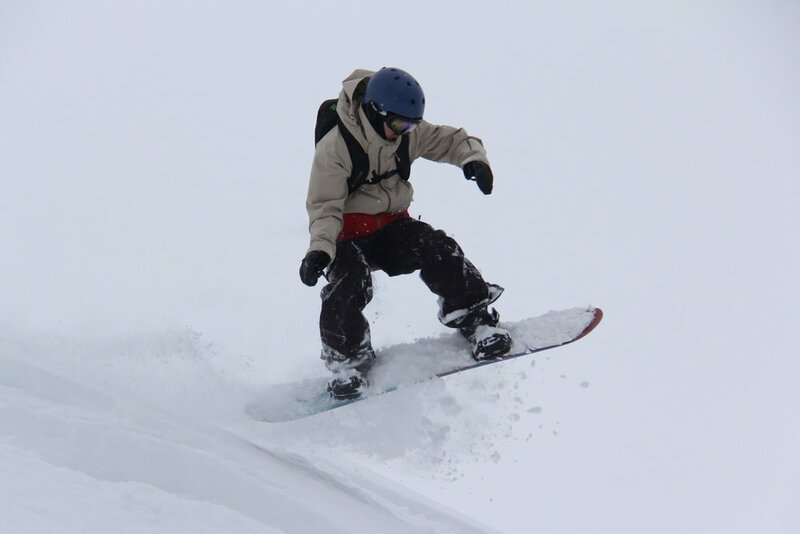 Yes this is our son the cancer survivor heli-boarding in Canada! I share this experience because it significantly altered my perspective. So much of what I felt during this time was simple - "I just don’t want this to happen." The experience gave me my first lessons in compassion, acceptance, and to value life’s moments as they arrive. I learned to accept help from family, friends and experts. I learned to appreciate faith and prayers. What I didn’t realize at the time was how these lessons would be directly related to the End-Of-Life Planning that is my life’s passion. I'd love to help you. Click here to schedule a free 15-minute consultation with me. I am the only daughter of six siblings and have over thirty immediate family members. My extended family is dynamic, close knit and engaging. I married an amazing man, who is still my best friend. I devoured motherhood retiring from high tech in order to focus on raising our three astonishing kids. I immediately invested in my community: volunteering at the kids school, serving on my church and professional boards, working for social justice, and starting my own company as a Certified Professional Organizer. I was always the person who was "prepared", “organized”, and "ready." Then five beloved and close family members each died within 7 years from wildly different circumstances with varying degrees of preparation and awareness. Had I known how much death that span of 7 years would bring I might have shut down entirely. The first and most shocking was being broadsided by my eldest brother’s startling suicide. I was dazed and devastated at the same time. I felt I’d entered a time warp. It was as if my world had come to a complete stop while the rest of the world carried on as normal. That feeling made me want to scream “don’t you realize that everything is different now?” And it was. The illusion of our seemingly “perfect” family had shattered and we struggled with the disbelief that one of our own could commit suicide. We were angry, hurt, and scared. How could he? In order to transcend the stigma associated with suicide, we had to learn to talk about it among ourselves, and with others. It was in leading and facilitating my family in group conversations that I began to see I had a gift for dealing with difficult end-of-life topics bravely and directly. Our faith tradition lead many to conclude that our brother was condemned to hell for eternity. I took a broader view, put my faith in the greater good of my brother’s life. I didn’t assign blame, not to my brother and not to God. Several spiritual leaders told me this was unusually wise. If you are dealing with the suicide of a loved one, let's schedule 15-minutes to talk. I can help. Then my Dad who was an accomplished, fit, very much in charge, “I am the Captain and don’t you forget it!” kind of guy, underwent a heart procedure that unexpectedly caused his kidneys, lungs, and heart to fail and put him in the ICU on life support. When he came out of the ICU his kidneys did not recover and it was crushing to watch as he lived stoically on dialysis for several years, his body failing more each month. Soon Mom was diagnosed with Alzheimer’s disease. Mom’s Alzheimer’s and Dad’s health required massive logistical and financial arrangements over many years that brought my brothers and I closer together, while also creating enormous conflict among us. It was the beginning of a very long and heavy-hearted journey. During this time I felt the weight of responsibility of caring for my children push against the weight of responsibility of caring for my parents. I tried to attend to my children's needs as I always had- showing up at their games, helping with school work, preparing family meals, even continuing to volunteer at the school. At the same time I was spending long days away from home first getting Mom settled in a memory care facility, then visiting with my Mom followed by visiting with my Dad, arranging lunch dates in order for them to be together, dealing with their health issues as they came up, and working on clearing the clutter from the house they shared for over 30 years. And unfortunately letting my own health suffer as a result of trying to do way too much rather than asking for the help I needed. If you are caring for a parent or loved one with Alzheimer's or dementia, let me help you. Let's schedule 15-minutes to talk. We were all there with Dad when he passed, except Mom. Her mental state had slipped so far that she simply did not believe Dad had kidney failure, nor that he had died. It was heart wrenching to experience because those two were so much in love. I am grateful to them both for the love they shared with each other and with me. My Mother-in-law, our beloved Abuelita, had helped us raise our three kids and embodied enthusiasm for life. We were convinced she would live to be 100! But she caught us all off guard and died alone at home from a stroke, the day before our daughter’s birthday. This was an overwhelmingly sad and confusing time. One of the things that attracted me to my husband was the way he loved and cared for his Mom. As an only child he was crushed by her death, so I took on the task of clearing out the home he grew up in. Abuelita had been a weekly fixture in our children’s lives since the birth of our eldest and seeing their grief over her death was wrenching. Shortly after my mother-in-law’s death my jovial, talented, smart Uncle died simply of old age and natural causes. Not unexpected, yet still hard to take, coming so quickly after the death of my mother-in-law. I remember being dismayed by family members who were unwilling to see and accept that he was dying. It seemed obvious to me. I went a bit numb after his death. I had become the family’s go to source for processing grief and staying grounded, while going through my own grieving process and organizing the logistics. As the calls came in, I had to learn what my own limits were, and how to establish compassionate boundaries. The one thing my Mom feared the most was losing her mental capability. Watching her lose exactly that, as well as her physical ability, bit-by-bit to Alzheimer’s, made me feel helpless, frustrated and angry on her behalf. There were so many beautiful moments mixed into this bittersweet decline that the memories still make me weep. The last step on my journey, caring for someone with Alzheimer’s, was emotionally exhausting. It is taxing to deal with the endlessly repetitive questions, as well as manage the paranoia and aggression that can show up randomly. “The truth” takes on new dimensions when conversing with someone who has dementia. Staying joy filled and grateful in the moment while the person you love no longer knows who you are is crucial to surviving as a caregiver. As my Mom’s health care power of attorney, I was responsible for making the decisions I felt she would make for herself. Sometimes health care decisions honoring my Mom’s wishes were in conflict with what I or some of my family members wanted. This was never easy. Week after week I honed the skills of communicating my Mom’s health and well being effectively to my large family group. After several years of slowly succumbing to the disease my brilliant, creative, caring Mom died from Alzheimer’s. I felt so conflicted. I was relieved she was free from the shackles Alzheimer’s had put on her, yet sad to be left an orphan, feeling a bit rudderless after so many years of caregiving. If you are the decision maker as a parent passes, schedule a 15-minute consult with me for assistance. My healing began and flourished because I reached out to others for support and guidance. I was fearless about going to a therapist after my brother died to heal my chasm of pain. I spent a week at a buddhist retreat with my niece to expand on my understanding of life, and death. I leaned into my family and faith community for support. I read dozens of books on death and dying, attended lectures and spoke with experts in the field. I sought to learn from my grief, researching and taking classes. I would talk with people about their grief and in doing so I became aware that I was developing a unique gift for helping others transcend grief as I had transcended mine. Experiencing so many deaths made me recognize how critically important it is to prepare for end-of-life before a health crisis occurs, while we are still healthy in mind and body. After my brother’s death, my husband and I updated all our documents and discussed our end-of-life wishes together. We know we will need to continue to have this conversation as our age and health changes. I have become an outspoken advocate for encouraging others to do the same. Throughout these cumulative experiences in my life, people have gravitated to me to share their struggles dealing with paperwork, personalities, or finding and sorting belongings. They describe the heavy burden they feel to make progress without a clear idea of where and how to start. But even that is not the central issue. The heart of my work is the ability to support people through their pain and grief while dealing with the problems they face. It’s not just about the tasks. It’s about making time and space to handle the difficult and essential emotions that come up, to allow room for grief. The cumulative experiences of my life allow me to serve people in preparing for death and dying. Clients come to me with the best intentions but immobilized and unable to break through their own fear, uncertainty and doubt. They frequently have seen or experienced dreadful situations that occurred as a result of not being prepared. They don’t want to repeat these situations in their own life and that fear weighs heavy on their minds. In doing end-of-life preparations with me, people discover they feel empowered, Lighter, and Deeply Satisfied. The awareness and acceptance they develop as a result of our process together brings appreciation, joy, and gratitude. I have a gift for helping people work through their end-of-life issues, while compassionately allowing room to deal with the complicated emotions and grief that surface. I have a unique and hard earned blend of deep listening and intuition, coupled with the ability to say what needs to be said. I know there is light and joy to be found through this process and I want to help you find it. It is my deep honor to do this work. I’ve been training for this my entire life.